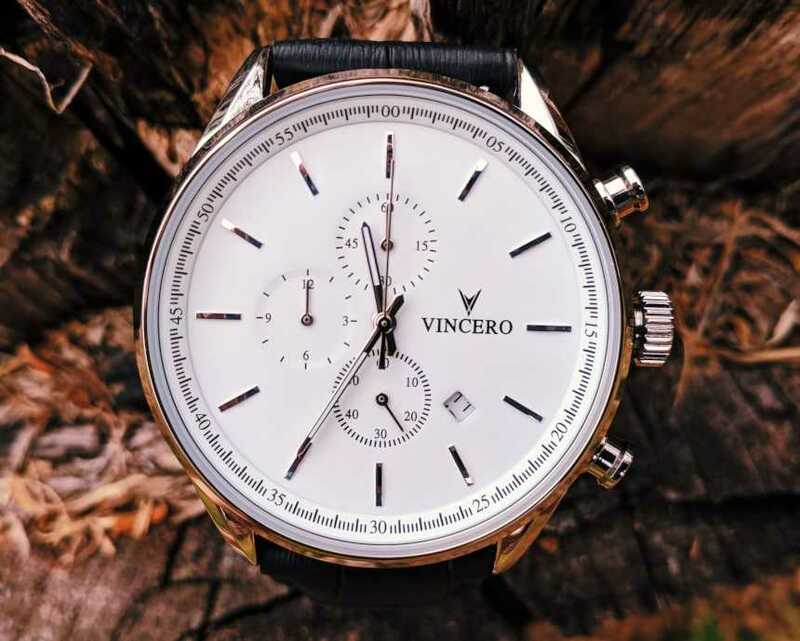 Vincero Watches Review: Are They Any Good? Disclosure: This is a sponsored post. We received compensation and courtesy product from Vincero in exchange for our honest review only. All opinions expressed here are our own. 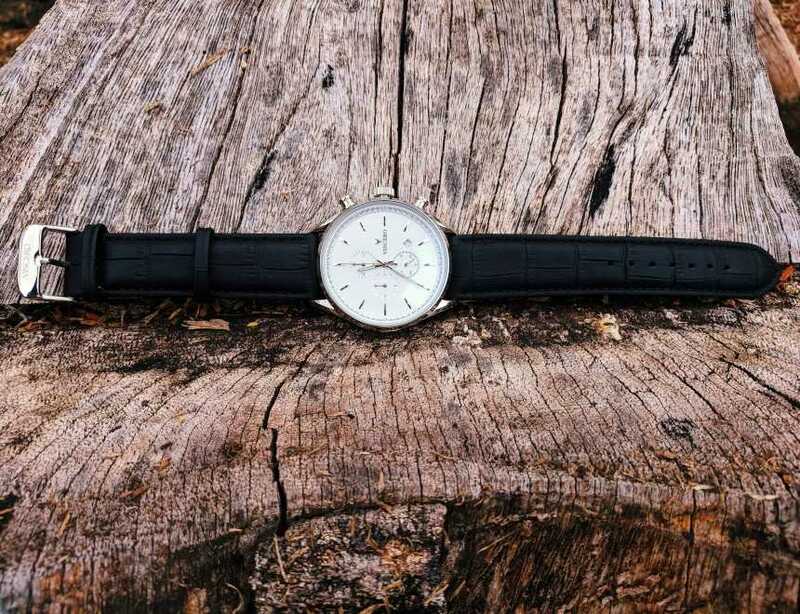 While there are a few minor feature gripes, in terms of build quality and beauty of design, Vincero watches provide excellent value for money at this price point. I’m hesitant anytime I hear about a newer watch brand that is suddenly everywhere. For me it was Facebook. In between Aunt Kathy’s third mundane weather update for the day and a cringe-worthy selfie from that guy I sort of knew in high school, there sat a candidate for my now waning attention. And while you may have your own version of Aunt Kathy, if you’re on Facebook, and assuming you’re into men’s fashion, you’ve probably had one of these pop up on your own feed. I’ll own up to it. 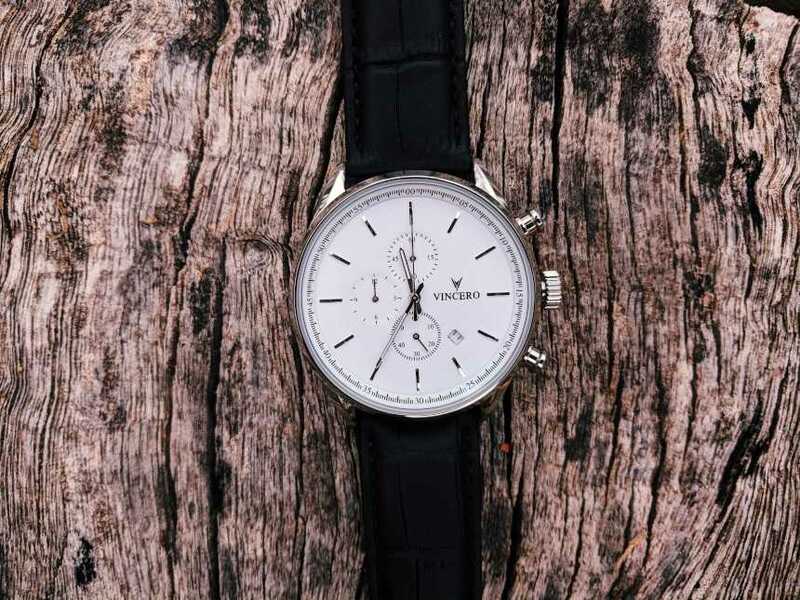 Vincero’s clean chronograph style and reasonable prices caught my attention. And I had to get my hands on one. And no, I didn’t start the article that way because I needed to pump myself up for this post (although I might start chanting that before I start writing from now on). I did so because Vincero means ‘I will win’ in Italian. And it’s why they chose the name. So did I win with my Vincero timepiece? Keep reading to find out. How are Vincero watches made? Does small batch manufacturing mean it’ll take longer than the 2-3 days to get to my door? Are these watches just outsourced to some random factory? 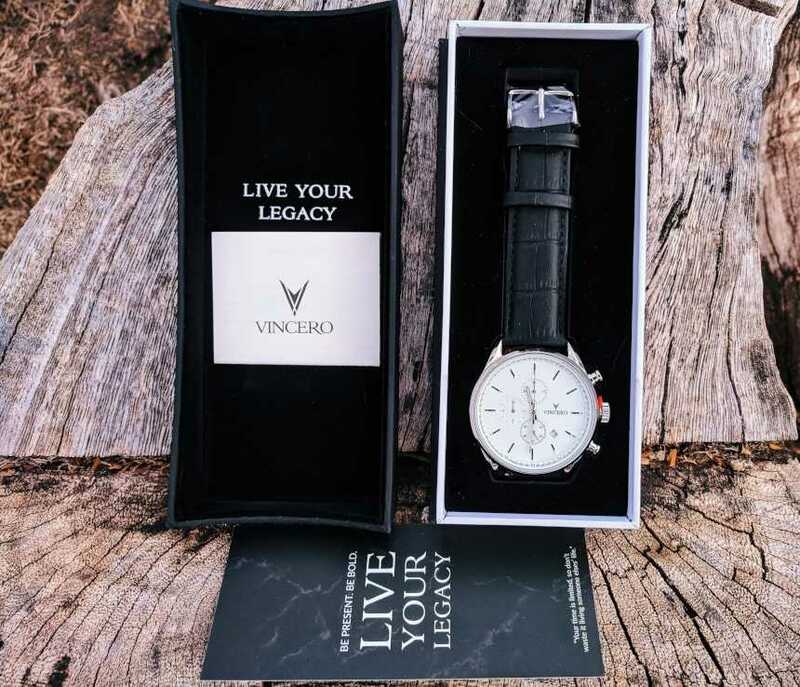 Where are Vincero watches made? What is the meaning of 'Vincero'? How wide is the band and is it replaceable? What movement do Vincero use? Do all mechanisms of the watch function? How much does the watch weigh? Do Vincero offer custom engraving? Vincero aim to hit that sweet spot between premier quality and affordability. Their pricing structure places them at the low-mid range of the luxury watch market with most of their watches falling between $149 and $169. They have developed a core range of six watch types and offer over 65 individual styles to choose from within that range. I like Vincero’s story. But it might just be because it gets my weird entrepreneurial blood going. The brand was built from the ground up by three friends bonded together by a mutual love for making things. I’ll give you the brief, but if you’re interested, it’s worth checking out their full story, here. The three guys dreamed of revolutionizing the luxury watch game and collectively ventured with a one-way ticket to Guangzhou, China. 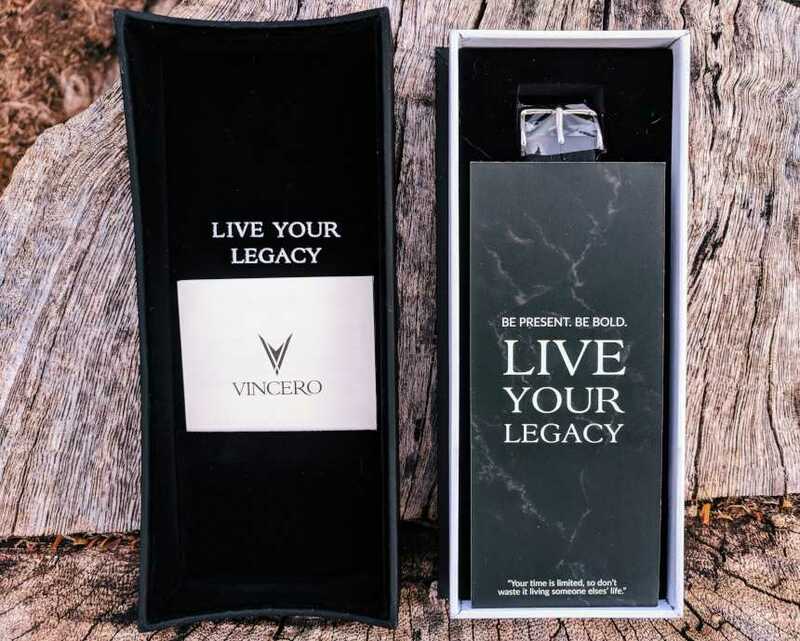 Their story claims that for years they survived on very little, didn’t take days off, and in 2014, they finally launched Vincero watches. Vincero’s vision is to create the best value luxury watches in the world. And their mantra? ‘Be Bold, Daring, and Pioneering’. To be fair to them, the brand don’t try to sell you on some dream of extremely inexpensive watches of the highest caliber. Instead, they aim to satisfy with affordable prices, unique yet timeless designs, and great build quality. I went for the black/silver model of the The Chrono S.
Firstly, I’m a sucker for a chronograph. Secondly, I chose black/silver because I don’t have many black strap/silver case watches in my current collection. And finally, it’s just the one that jumped out at me. You know how it goes. Dimensionally, the watch is 43mm in diameter, 11mm thick, and features a 22mm wide strap Italian leather strap. The case is made from 316L surgical grade stainless steel and the case back is Italian marble showcase. It has 5 ATM water resistance, Citizen Miyota Quartz movement, and scratch-resistant sapphire coated crystal glass. There are three sub-dials on the Chrono S. The sub-dial at 6pm is the seconds hand. The top one at 12pm is the chrono minutes timer (up to 60 rotations), while the sub-dial at 9pm is the chrono hours timer (up to 12 rotations). Mocha, tan, or classic black leather straps are available as paid extras for added versatility. The Chrono S comes housed in a black rectangular box with a cardboard sleeve. 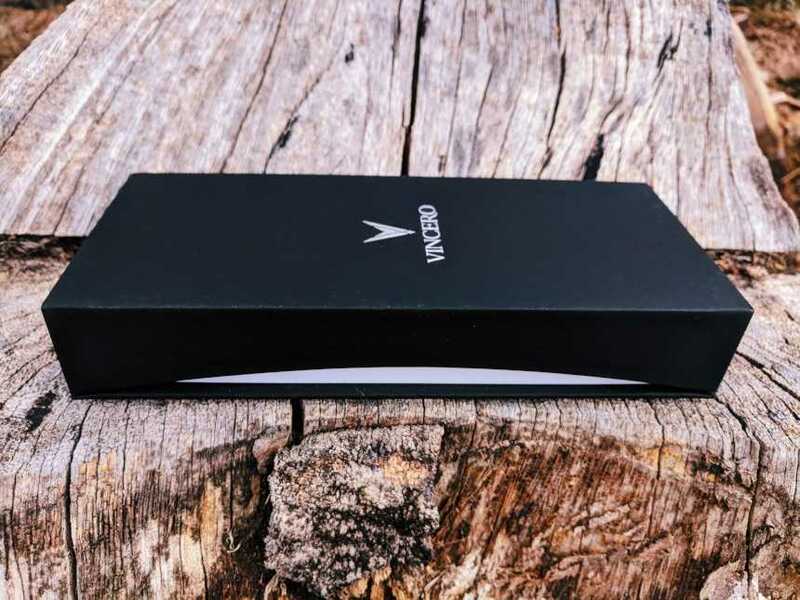 The box is sturdy and functional with the Vincero logo engraved tastefully on top. It features arched edges all the way around which adds a nice touch. There’s a prominent barcode on the side of the sleeve which in my view slightly detracts from the elegant look they’re going for. 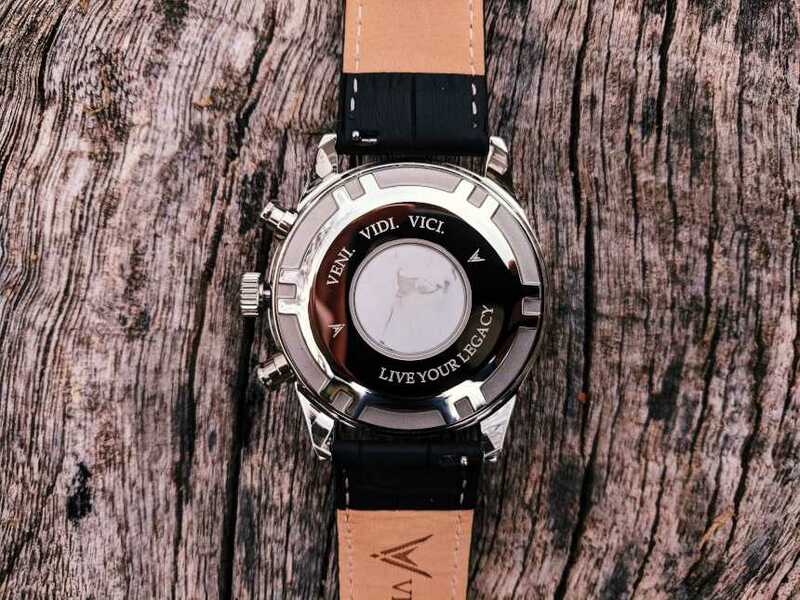 The inside of the watch lid features their main tagline ‘Live your legacy’. Tucked into the disguised pocket of the lid is a thank you card and a small instruction booklet. Overall, I’ve seen higher quality watch boxes in my time. But at this price point, it does the job—and it would function just fine as a gift. 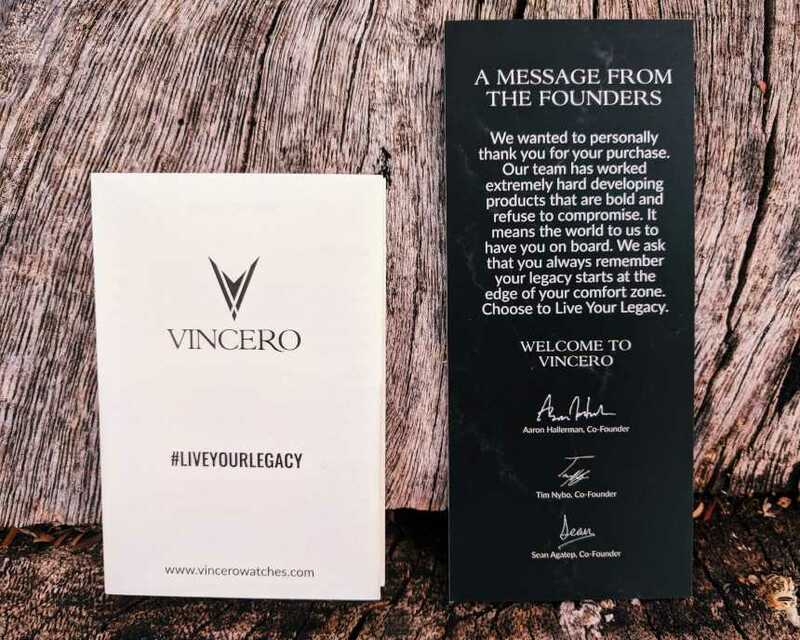 The thank you card is a nice touch and it gives you the cliff notes of what Vincero is all about. 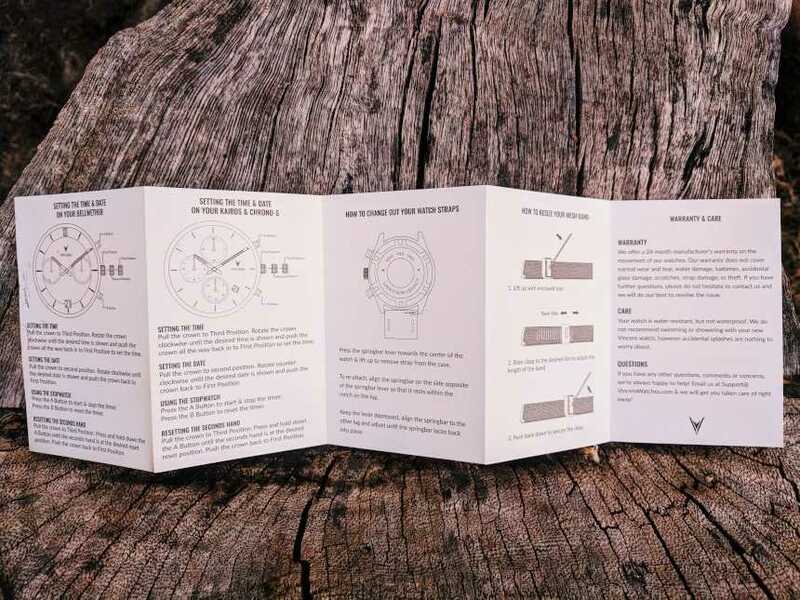 The instruction booklet is also well put together and I like that it outlines their story, mission, and process, in addition to the standard watch instructions and warranty/care info. Now, onto the watch itself. My Chrono S was tucked in nicely where it should be in the box on arrival, which was a good start. The face and case back had a plastic covering as you’d expect, as did the buckle. Removing the plastic was easy, and once I did, I was really pleased with the way the dial looked through the sapphire crystal. Sometimes what you see on a watch company’s website doesn’t translate to what you see when you get the face in your hands. But in this case, I can honestly say that my expectations were met. The dial looked stunning out of the box and the case arrived free of marks or scratches. The watch also has a nice weight to it and the band has that new leather smell and quality feel. On the downside, the band is a little stiffer than other new leather bands I’ve felt. A fun fact about their watches is the engravement on the caseback of every timepiece they produce. Veni. Vidi. Vici. The famous italian statement which means, I came. I saw. I conquered. Are you seeing the link with the ‘I will win’ translation of the name Vincero, yet? It looks stunning. It really draws the eye and I’ve received a bunch of compliments on it. It’s clear that Vincero put a lot of time and attention to detail into the overall craftsmanship. The watch’s quality feel and expensive look makes it a universally fantastic gift. The stainless steel and Italian marble caseback gives the watch a nice weight. It has the perfect balance of feeling great in your hands but not too heavy on your wrist. Overall, the watch looked just as good in person as it did on the website. There’s no spotting or dullness to it, even after several weeks of wear. I like that they offer a wide range of designs. It’s impossible not to find at least one design you like. It’s more likely you’ll be scratching your head trying to decide on just one. The price is on point. The watch looks and feels like a $250+ watch. You feel like you’re getting solid value for money. In terms of keeping the time, it hasn’t missed a beat since I got it (important for a watch, I’d say?). 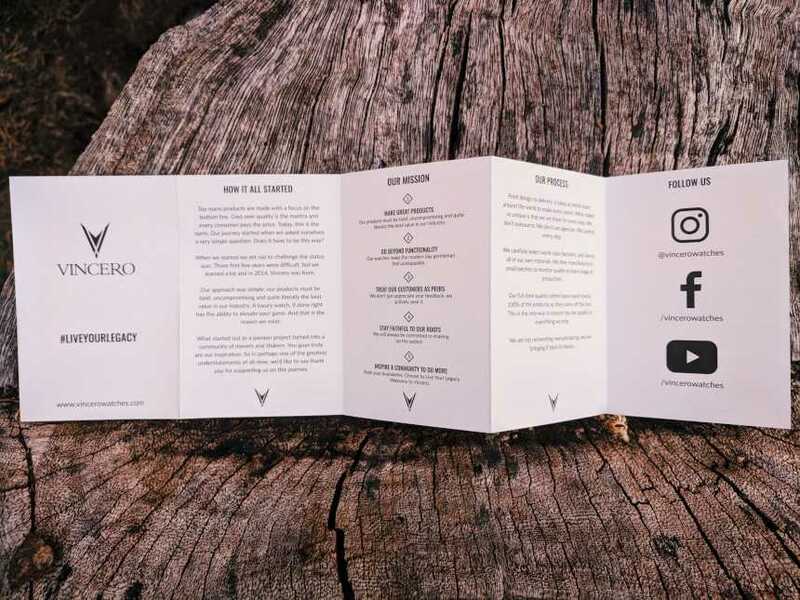 The inserts are tastefully branded and I like that the instruction booklet includes details about the brand’s story, mission, and manufacturing process. Some watchmakers ignore this but it really helps you make a stronger connection with the brand. The leather band is noticeably stiff out of the box and takes some time to break in. It took mine around two weeks to feel supple on my wrist. The box is a little bland and not overly unique, but at the end of the day, you don’t buy a watch for its box. The lume on the hands is quite dull. It’s tough to read the watch in low light. I’ve read a few reviews reporting this same issues, while others have said it’s perfectly bright. It may be luck of the draw. The standalone leather strap add-ons are a little pricey. Yes, the strap is a little stiff. And yes, the box isn’t all that unique and the lume could be brighter. But for a sub $200 watch you genuinely feel like you are getting outstanding value for money with Vincero. The Chrono S looks and feels expensive, and I like my watches to have some weight to them as this one does. The brand have nailed that balance between affordability and quality. And because of their wide range of styles, you’re guaranteed to find one that fits the aesthetic you’re looking for. Read customer reviews on Amazon or on the Vincero store. If you’re still undecided, take a look at Vincero’s other bestsellers here. Vincero has a simplistic store setup. They don’t crowd you with a hundred options. Whether it’s a watch or a strap you’re chasing, you’ll find it pretty quickly. Hover your mouse over the men’s section, and click on a series of watch, or browse the lot of them at once. It’s as simple as making an Amazon order. Inspect the item you want, add it to your cart, and checkout. You can checkout using PayPal or Amazon Pay, speeding up the process. You’ll be given the option to calculate shipping rates. You automatically get free shipping with any purchase of a watch, though you can determine overnight or priority overnight shipping, available through FedEx. If you’re in no rush, you’ll get standard two to three day shipping. Fill out your address information, pass through their SSL-secure shop, and you’re good to go. Sit back and wait. It’ll be here before you know it. Vincero uses Miyota movements on nearly all of their watches, and unless you have a hobby in clockmaking, this is something you’ll have to head into a local shop to have repaired. 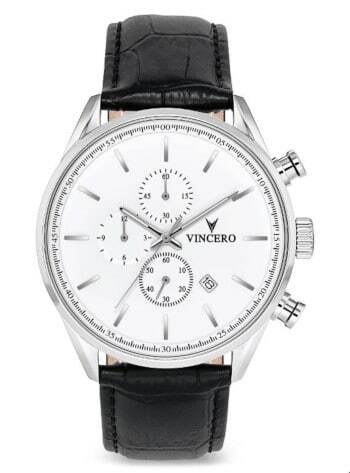 Vincero offers a twenty-four month warranty on all watches, which will include repairs. If your watch is over that two-year threshold, you’ll have to seek out an independent watch repair kiosk or shop. Issues like the movement or problems with your crown or a loose case back should all be tended to by a professional. The other aspects of maintaining your Vincero watch are quite easy. You’ll only really have to focus on your strap and the buckle, switching it out when it gets worn down with passing time. Apart from that, it all comes down to cleanliness. Vincero timepieces are built sturdy, but there are some care precautions you want to take into consideration. All Vincero watch cases are made out of surgical-grade stainless steel, which is incredibly easy to keep clean. You don’t need to polish it, simply give it a quick wipe down with a microfiber cloth each day. I don’t recommend using a cotton face cloth. When you graze the crown or case back, you could get a small thread stuck somewhere in a small crevice. This is something you run into with every brand of watch. Take your time cleaning the edge of the case back. Sweat builds up from daily wear, and clings to steel very easily. Wipe it down every night when you take it off before heading to bed. Lastly, because the dial window is sapphire coated, avoid using chemicals when cleaning. You could use an eyeglass cleaning spray two-hundred times and still have that coating, but it does degrade it over time, and it’s always good to opt for the best practice. They use small batch manufacturing. They keep it in a controlled amount to put each watch through rigorous testing and quality control, ensuring that their watches live up to the name before landing on your doorstep. Most manufacturers sample a percentage of their final production and test those. Vincero tests 100% of all watches before shipping. No. It seems that Vincero updates their website to state when something is out of stock. You’ll be given the option to reserve order it, or be notified via email when it’s back available. Vincero is on-site and has their personal team to ensure quality from step one of manufacturing through to shipping. They employ over 360 workers in factories that have been in service for over seventy years. Vincero’s final assembly stage takes place in Guangzhou, China, though they source materials from various areas all around the world. It means ‘I will win‘ in Italian, drawn from the famous statement ‘veni, vidi, vici’. Which translates in English to ‘I came. I saw. I conquered’. 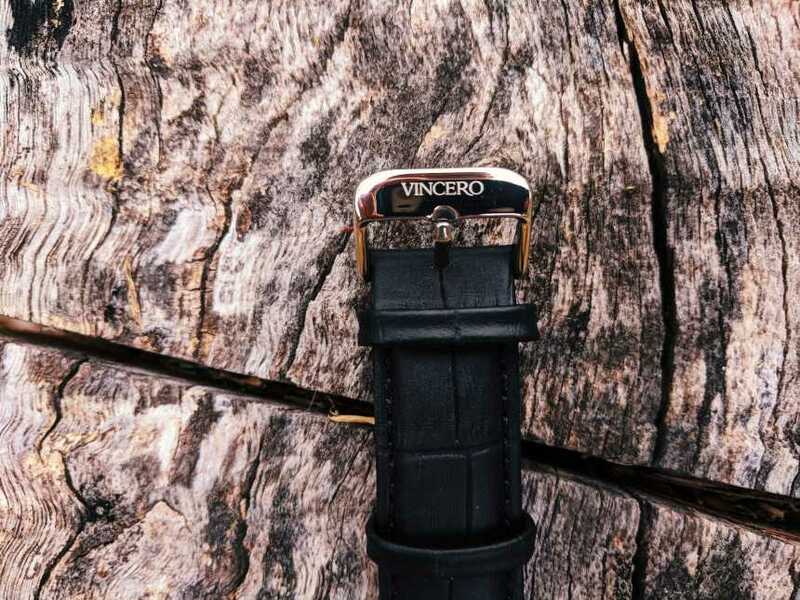 Most bands come in at 22mm, specifically designed to compliment two different case sizes that Vincero offers: 40mm, and 43mm. For men’s watches, 40mm is usually the lowest you want to go. You want a 2:1 ratio on case and strap size, respectively. They offer a wide selection of top-grain leather bands on their website. Since they have a few different watch case colors, grabbing a secondary band is an excellent way to dress up or dress down a watch for a specific style code. The Chrono S that I received is only waterproof up to five ATM, or five bars if you’re more familiar with that terminology. Ten meters of water resistance, roughly being thirty-three feet. This is a fairly standard waterproof rating. Good for repelling light rainfall, a splash while washing your hands won’t harm it, but it cannot be submerged for any reason. If you forget that it’s on when you hop in the shower, step back out, take it off, and dry it with your towel. 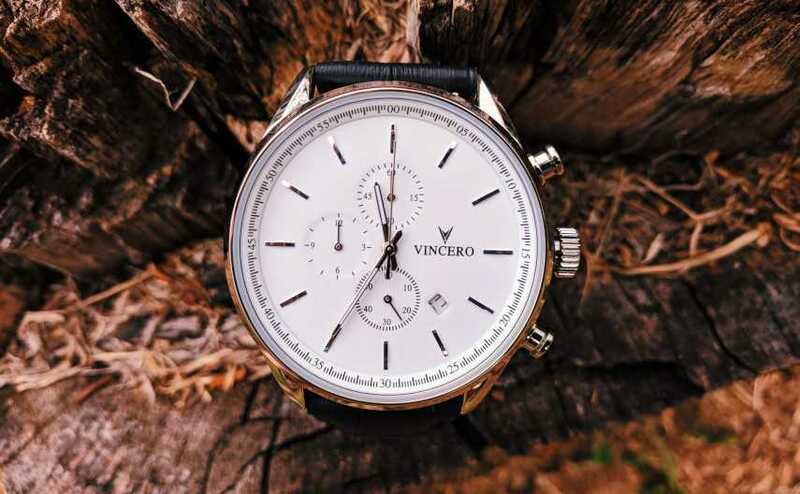 Vincero watches are made for close time precision, and when you get into watches with a higher bar water resistance rating, you’ll notice a lot of reviews talking about it “losing seconds each day.” That’s because the case is wound tightly to upgrade the water resistance rating. Vincero makes theirs waterproof enough, while still being functional above all else. 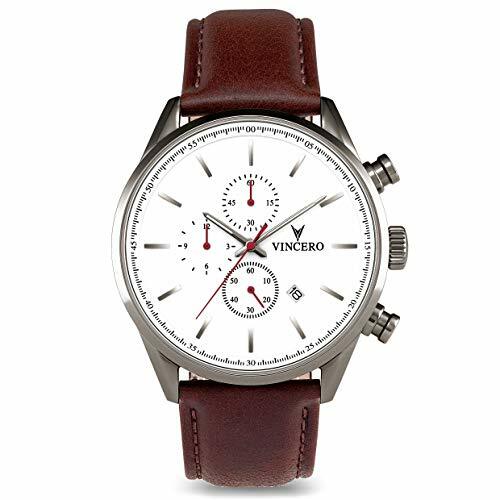 Vincero watches have a Citizen Miyota quartz movement which is a Japanese quartz. The two most popular quartz movement types are Japanese quartz, and Swiss quartz. Miyota represents the pinnacle of quality for Japanese quartz watches. But it’s about on par with an entry level Swiss quartz movement. It’s dependable and easy to service. Each aspect of the Chrono S functions well mechanically. In my research, I found some older reviews claiming that some functions didn’t work. After digging deeper, it seems this is a problem that has since been remedied. The Chrono S weighs a little over six ounces. Not on all watches, but if you grab a Chrono S or a Kairos, you can get a personalized message in place of their trademark Latin phrase on the back of the case. They also offer other gifting options as well. 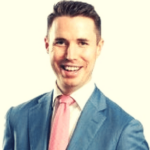 Whether you’re getting a series of group gifts for your employees, clients, or want your groomsmen to look uniformly stunning on your big day. You can go through their site and fill out a simple form to arrange this up with ease. Vincero watches offer bang for your buck and they’re built to last. Maintenance issues are few and far between, and their collection gives you a different look for various dress codes and attire. Based on the materials they use, their customer service, and their high level of craftsmanship, they’re a cut above many other watch brands in the same price range. The strap may take a little bit longer to break in than you might be used to, and the box is a little basic, but these are minor details in the grand scheme. The truth is, I get more compliments wearing my Vincero than I do with my (significantly pricier) Sinn Regulateur. In the end, my Chrono S earns a decent chunk of wrist time. And so I can confidently say that ‘I did win’ with Vincero. And when it comes to watches—if you’re not winning, you’re losing.